Frag! is licensed under a Creative Commons Attribution 3.0 Unported License. Permissions beyond the scope of this license may be available. Posted to Flickr on 03 November 2009. 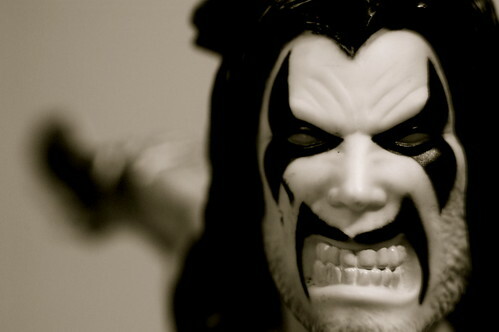 Lobo is an interstellar bounty hunter from the pages of DC Comics. Like Superman, he is the last survivor of his race, has exceptional strength, and hunts down bad guys. Unlike Superman, he killed everyone else on his planet, is exceptionally violent, and occassionally hunts down good guys too. Originally intended as a parody and an indictment of over-the-top violent comic book characters, Lobo eventually became their standard bearer. This photo was posted to Flickr on 03 November 2009. It was one of 500 images featured on Flickr Explore for that day. The last time I checked, it had 4,331 views on Flickr. Frag! by JD Hancock is licensed under a Creative Commons Attribution 3.0 Unported License. Permissions beyond the scope of this license may be available.